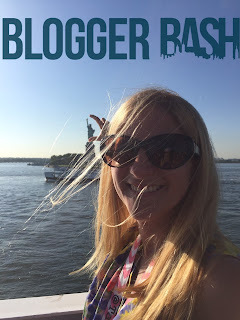 For the last three years, I have been attending the annual Blogger Bash conference in Manhattan. This summer however, it was on a boat! 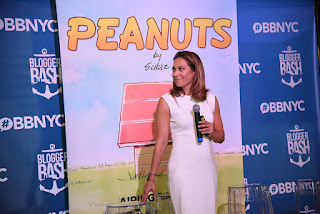 Check out the highlights below from the celebrities that joined us to cool new products and blogging tools. 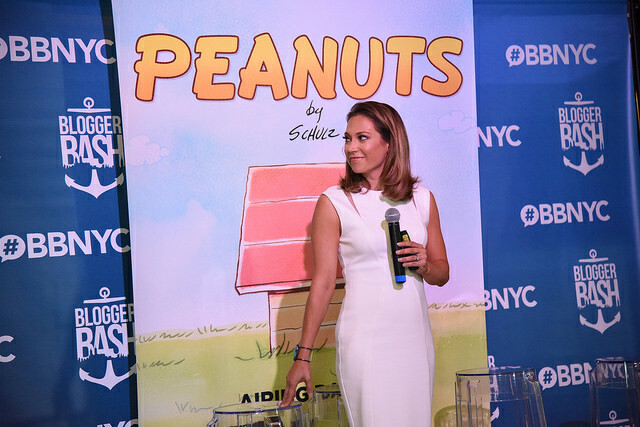 Ginger Zee the Good Morning American weather anchor came on board to introduce the child voice actors of the new Peanuts vignettes on Boomerang network. I really enjoyed hearing about her honest experience as a new mom. I was especially sad to hear that she was attacked online for pumping and not spending enough time with her baby while being on Dancing with the Stars. As a mom, I know how terrible mom guilt is and that's mostly the guilt I put on myself, so I can't imagine how difficult it would be to have outsiders being negative and making me feel worse. Terrible. I also teared up at the video she shared of how she informed her husband Ben that she was pregnant thorough an edited video to him, so sweet. Met the amazing Noah Galloway too, while the combat Army Veteran and Dancing with the Stars finalist was over at the Armitron Watches booth. I was a fan of his on DWTS where I was dazzled by his handsomeness and strength. 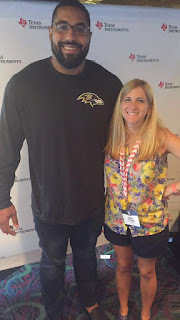 I then felt even shorter than I normally do while hanging out with NFL Lineman for the Baltimore Ravens John Urschel 🏈 who was over at the Texas Instruments booth to discuss their STEM Behind Sports program to get kids interested in math and excited for back-to-school. Besides being a cool sports star John is an MIT Mathematics PhD Student. Thus, showing kids that it can be cool to learn math. Oh, and I was excited to send the following pic back home to my boys of me with Jet from the favorite show Super Wings on the Sprout Channel. 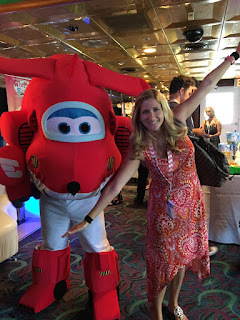 Also got to preview Auldey Toys' new Super Wings-inspired toys, which I have now added to my boys' future birthday gift list! 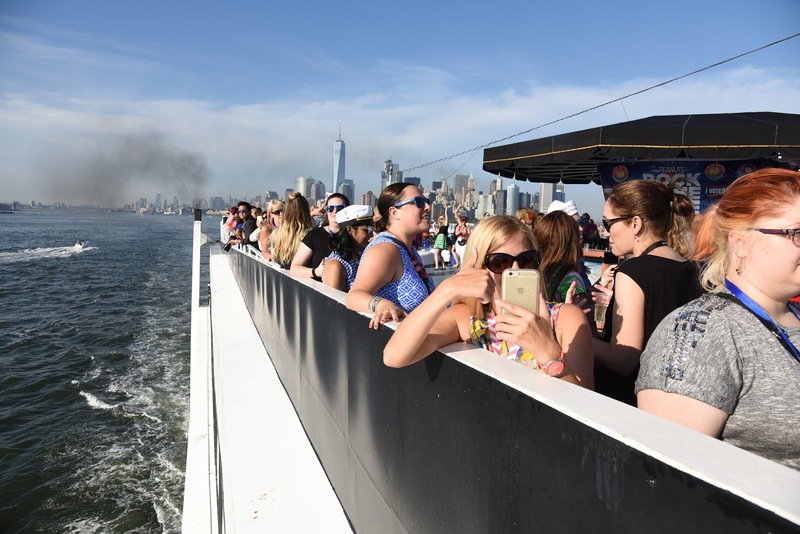 While we met dozens of brands during the two day conference and received demos and samples of new products, some of which I'll go into more detail at a later point, but for now here are some that I found particularly interesting. So yeah, while on the boat, I ate a cricket! Yes, you read that right. A dead, dried insect. Why? Because apparently they are a high-protein, nutrient rich, environmentally friendly, alternative to meat. Surprisingly, covered in salt and spices, it tasted like a crunchy pumpkin seed. Aketta produces cricket flour and dried roasted crickets in a bag. My boys are in need of protein so I brought back some for them to try. Hopefully they find the idea disgustingly fun and will try it. Boys! Did you know you should be introducing your infant to peanuts before six months of age? Scientific research shows EARLY introduction of peanuts to infants helps prevent peanut allergies from developing. 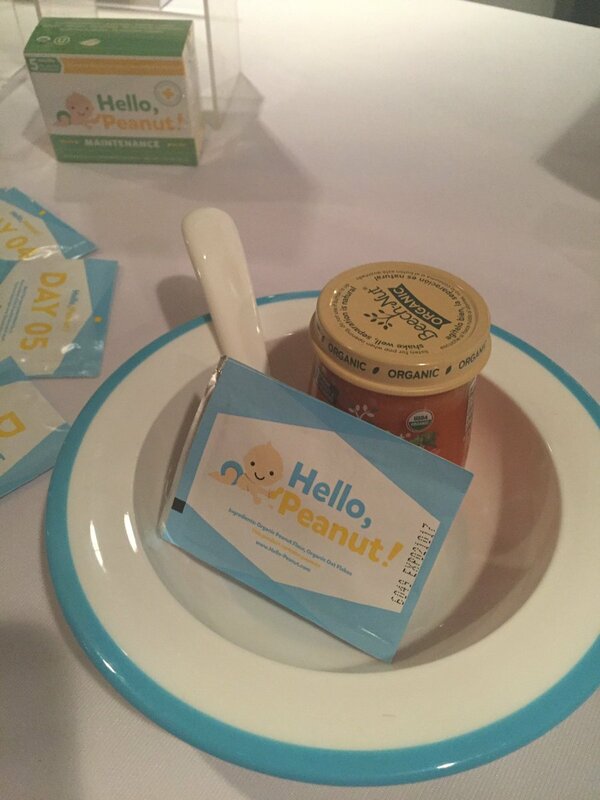 Hello Peanut is a new way to gradually introduce peanuts to infants! Made of an all-natural USDA certified organic blend of peanut and sprouted oats, the introductory system includes seven packets that are mixed into stage one foods over the course of seven days. The amount of peanut in each packet gradually increases each day. 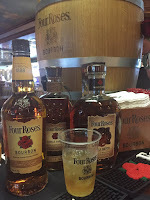 Four Roses Bourbon - As you may know, I'm a whiskey drinker and while I normally prefer single malt Scotch, I really enjoyed the Small Batch bottle of Four Roses, which was surprisingly smooth. I also thought the bottles were lovely with their wooden tops and etched roses on the glass bottles. Since we aren't coffee drinkers, we only keep a single serve Keurig machine in the house and K-Cups for when guests visit and need their java. My mother included. However, I always ask that they save the used cups instead of tossing them, so I can cut into them and add the grinds to my compost. It's dirty and time consuming, but not for much longer. Now there are certified 100% compostable pods from Chock Full o' Nuts, Kauai Coffee and Hills Bros. Publix carries them even. I'm so going to be buying these from now on. Visit CoffeeComposting.com to learn more. Your garden will be greener – and so will the planet. How genius is this product for baby? 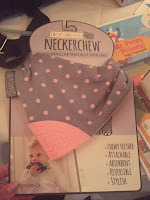 I wish my boys had Neckerchews from Cheeky Chompers when they were teething. This chew toy catches drool since it is attached to a bib. Also, you don't have to worry about them dropping their teether since it fastens behind their neck. Love the colors and soft fabric and it's reversible too. Oh, and we want/need Uncle Bubble's MEGALOOP, a giant bubble maker available this holiday season. Take a look at this quick Instagram video where I was able to go inside the bubble, so fun! Besides the partying and swag, even this seasoned blogger learned a few new tricks and tools the trade to try. Discovered Tailwind for scheduling pins on Pinterest. The app is currently offering a FREE trial, which I am now starting to take advantage of. If you would like to be added to my tribes, shoot me an email. Several bloggers shared that they generate revenue through Linqia. Just signed up to be an influencer there too. Want to see more? 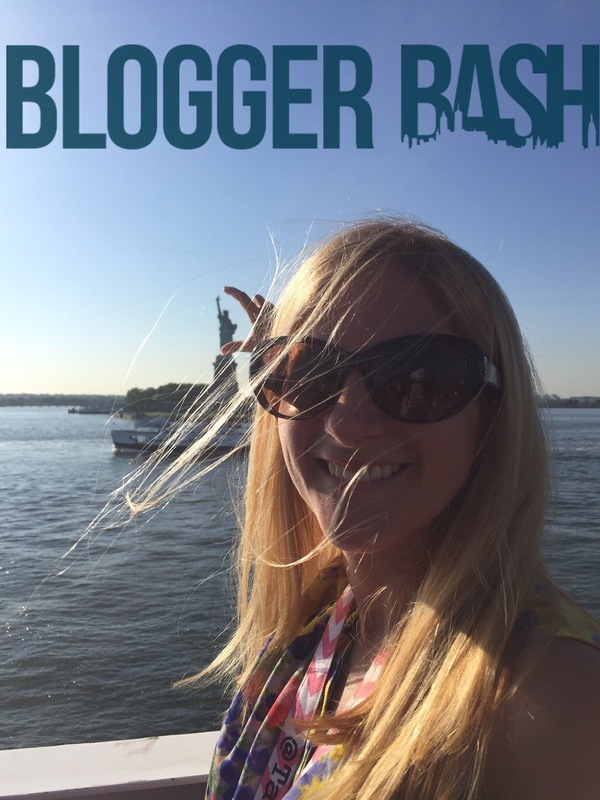 Check out my Periscope video from the after party cruise around the Statue of Liberty. 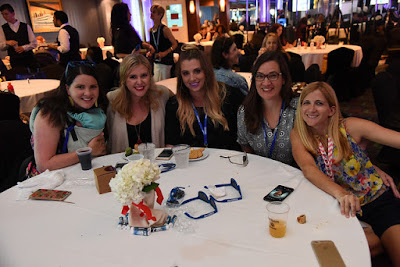 For more read my blogging pal Destiny's Blogger Bash 2016 recap. I can't believe you ate the cricket! I loved hanging out and learning from each other! Can't wait for the next one!